I don't understand how you can open a drawing that was done previously, work on it for 5 minutes, forget to save it and not be able to reopen the original DWG file. Where did it disappear to? Did you search your entire hard drive? You're not on a network are you? Something seems amiss. I remember that there is an issue with saving file while working in Block Editor. This could be it. If this is the case, then the only hope is the backup file or autosave. If there is no backup, then he need to redraw it from scratch. Yes, I've encountered that issue a few times before. The file size ,currently, is 62.3KB. Now we are getting some useful information. It is unlikely there is anything salvagable in that file, but you might attach it here as requested previously for others to check. The problem is,that I thought I had saved the file in my normal manner,but in the flap at the time I have obviously not done so. I have located a .BAK file but that is the same size and I cannot open it anyway. I do find meaningless and trivial not particularly helpful in this context-----but then you don't have the problem. I will thank you for your interest----i have brought some amusement into your ivory towers and I shall continue to redraw the file. I distinctly recall telling you what to do with a BAK file (i.e. - renaming). Maybe you skipped reading that post. Hope the OP comes back, I'm interested in how this one plays out. I hope the OP figures out that he probably only lost 5 minutes of work. This is just a classic example of not really knowing your CAD system and how it backs up your work. 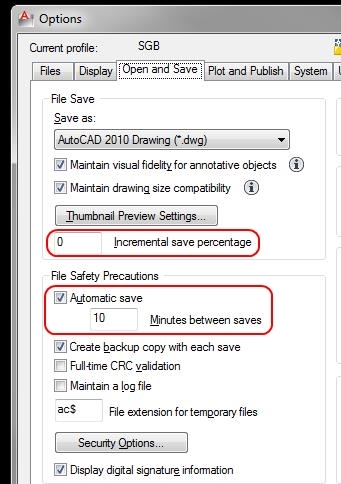 Not picking on the OP but any good CAD user should know this. If that is the case, it should be cured with RECOVER. Supposed to be updates to fix the "save from block editor" problem. I want to make sure you understand the meaning of my reference to "floaters". Occasionally you might accidently create some little piece of geometry far far away from the main geometry. Then when you do a zoom all because AutoCAD has to back out so far to show everything - the geometry appears so small on the screen that it actually disappears. The sudden reaction is "all is lost". But it isn't really - simply need to find the floater(s) and delete or move closer the main geometry. Everyone here has been through the same thing you experienced and learned these lessons the hard way. I am certain there is nothing floating. After many years on a drawing board,I am not confident with CAD or computers-----How do I attach the file to this message!!!!! Under the Quick Reply text input field, click "Go Advanced," then "Manage Attachments." I concur that there is no need to feel offended here. Everyone has had these moments of dread and panic, and everyone has lost drawings and data; consequently, everyone here feels for you. They just have not yet given up hope, because recovery may be very near and much easier than you think. I do admit--and I apologize for not being able to help it--that I was a bit amused at the ludicrous accusations, especially when so many are earnestly trying to help…for free! If you are able to figure out how to post the drawing, be sure to post the .bak file as well, just in case it is somehow different. As for floaters, how can you be so sure? You are too inexperienced at this to say this so confidently. Floaters can easily be created accidentally without one’s realizing it. This is especially true when using COPY, as your original item is left intact. All you have to do is accidentally treat the base point as the displacement by hitting Enter prematurely. You may be wondering why nothing happened. While it may look like nothing happened, there is now a perfect copy floating way out there in space, just like you told it to do, accidentally of course. Less likely things could hide everything from you, e.g., all Layers OFF or all Frozen. The Block Editor scenario mentioned does not seem likely, as you said you did not Save. In many cases, one way to tell if you have anything in your drawing would be to enter the command SELECT and then the option ALL. If it reports 0 objects found, then you may indeed have an empty drawing. But it sounds like you do not, so why not give it a try just to see? Be sure to tell us what you find. Looks blank to me. So now it is time to look at the .bak file as well as the .sv$ file (if there is one for this file). I only see one layer in the drawing, is that correct? I find the time report rather interesting. See attachment. What I mean is, that drawing has only been opened for edit for about an hour and twenty minutes. It is definitely not a drawing that has been opened and worked on for up to three weeks, and the drawing is absolutely empty. I have a feeling the OP may have saved the default Drawing1.dwg over the original drawing somehow. this would probably render the .bak file empty as well. You could be on to something there---I dimly recall Drawing1.dwg surfacing during the the shutdown panic. I would like to thank everyone who has shown an interest---I've given up on any recovery possibility and I'm well on the path to recreation. 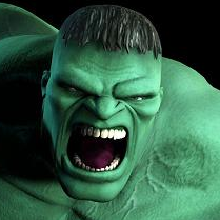 I think you said AutoCAD was set up to create BAK files. Did you find where the files were being saved to so you know in the future where to find them if you need to? What do you have the time span set for re: automatic saves? I would still look for the .bak file or the .sv$ files. Something I always do when I set up a new install of AutoCAD is the create a folder on the hard drive under C: for my "automatic save file location". 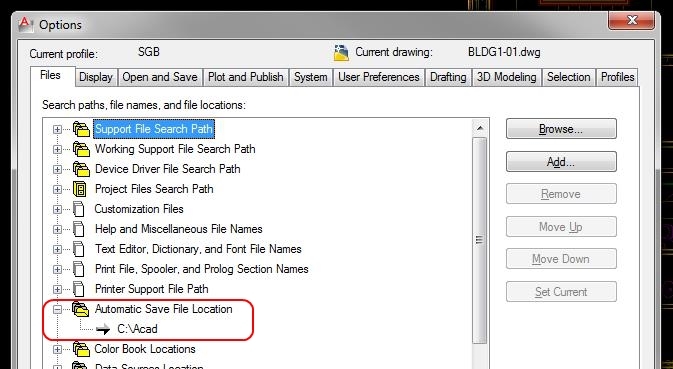 Create the folder and then go into AutoCAD's options and select this folder for this function. I also am a bit paranoid about autosaves and I have mine set to 10 minutes and I have my incremental save percentage set to 0 so it does a full save. Just some things to look at so you don't lose work. Good luck.